The Enterprise is docked above Earth completing some much needed, post-Borg repairs and upgrades, so everyone onboard uses the opportunity to phone home. Picard packs his bags for La Barre, his quaint little French hometown; Worf reluctantly prepares to receive his adoptive parents, the very kind, very Russian Sergey and Helena Rozhenko; and Dr. Crusher picks up an old box of Jack Crusher’s things from storage, including a holographic message he recorded for Wesley shortly after he was born. 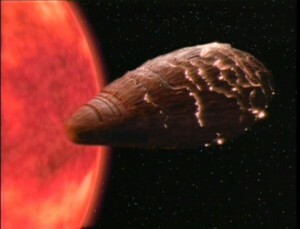 The Enterprise investigates a distress signal from Jouret IV, with whom they lost contact 12 hours earlier. When they arrive, not only are there no life signs of the 900 inhabitants, but there are no signs life was ever there at all. What’s left of New Providence, the settlement, is a giant crater. Picard is joined by an Admiral Hanson and young Commander Shelby, who believe that this is an attack by the Borg… an attack that has caught the Federation completely unprepared. 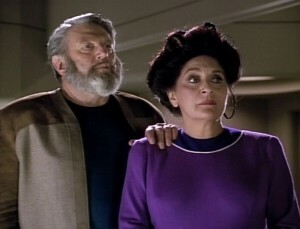 The Enterprise is hosting a trade agreement conference while in orbit around Betazed, which means it’s time for another installment of How I Studiously Avoided Meeting Your Mother starring Lwaxana Troi. Lwaxana seems happy at the chance to further berate her daughter for choosing a career over babies on Betazed, but gets derailed when a Ferengi named DaiMon Tog hits on her in the middle of the reception. For some reason “I would pay handsomely for you” doesn’t work on her, and she spurns him in front of the delegation before storming off. But Tog isn’t superficial–he wants her mind, too. To give him an edge on negotiations. Riker gets assigned shore leave, so he and Deanna go for a walk down Memory Lane–and also the Huntington Library Botanical Gardens–on Betazed. But their little date is spoiled when Lwaxana and Mr. Homn arrive, and start Meddling. Mr. Homn goes off to pick some berries while Riker, Deanna, and Lwaxana get more and more irritated with one another. Just then, DaiMon Tog beams down! 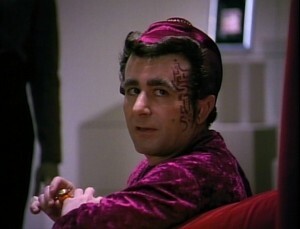 He still has the hots for Mama Troi, and won’t take no for an answer–beaming them all back to his ship. There’s a tricyanate contamination on Beta Agni II, and the only cure is more cowbell hytritium, a rare and volatile element that only one man in the universe seems to have: Kivas Fajo, a space trader. 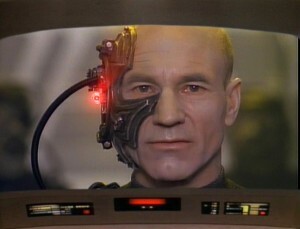 On the last transport to the Enterprise, Data uses his thumbprint to confirm the transaction and the datapad zaps him. Fajo’s men (and woman) plant fake Data elements on the transport, launch it out of the shuttle bay, and blow it up. Stunned, the Enterprise crew believe that Data’s been destroyed, but have to high-tail it to Beta Agni II if they want to decontaminate that water supply in time to save the planet. The Enterprise has an unexpected run-in with Captain DeSoto, who interrupts a really boring charting mission with top secret, ix-nay on the Omulan-Ray implications. He sends over a passenger, a Betazed named Tam Elbrun–“of the Ghorusda disaster,” whatever that means–who is to be the mission specialist of the week. He and Troi have already met, however, back at Betazed University, where she was studying basic visual cues and he was a patient. The mission? Approach a star about to go supernova, currently orbited by what appears to be a living ship that Elbrun has dubbed the “tin man.” Not only that, but they have to get there before the Romulans do, or else. Picard’s chillaxin’ in his quarters, reading a book (or rather, sleeping with one) when a probe enters his room, scans him, and beams him away. When Picard awakes, he finds himself in a locked room with two others: a Bolian Starfleet cadet named Mitena Haro, and a milquetoast Mizarian named Kova Tholl. After several busy weeks I finally got around to seeing the new AbramsTrek. 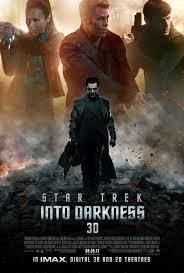 I didn’t like the first one because it felt like a lame action movie with a Trek skin grafted over it. This is much, much worse. Warning: this will be a spoiler post, so do not proceed if you have not seen the movie and wish to remain unspoiled. Data summons Wesley, La Forge, and Troi to his lab for some Really Big News. After a drumroll, he unveils… a thing! They’re not really sure what it is–it seems to be a Soong-type android in beta–until it calls Data “father” and Data explains that this is his child, Lal. Data interrupts Picard’s art class to tell him that they’ve arrived at Tenuga IV and also that Picard couldn’t paint his way out of a Rothko. It seems Riker and La Forge conducted a survey of Dr. Apgar’s work on Krieger waves, which they hope will become a new energy source. La Forge says in so many words that Riker surveyed someone just a little too intimately and is in a rush to return. But as he beams back, Dr. Apgar’s science station explodes, and Riker barely makes it home intact. But his luck isn’t meant to last, because an Inspector Krag beams aboard and arrests Riker… for murder.